As I pulled into the Holiday Inn on Van Ness at 6:30 AM last Monday there were about 150 police officers outside. What the hell?! I was arriving early to coordinate our annual Martin Luther King Day Breakfast. Everybody knew there was going to be some kind of protest, but WOW! At 8 AM many of our guests were already inside when I started getting text messages that police had begun to screen everyone coming in. I went nuts! The Labor Council and the Nor Cal MLK Committee did not ask for this police presence. All guests, and frankly, all peaceful protesters, were welcome. I had given the hotel management that message on Sunday. 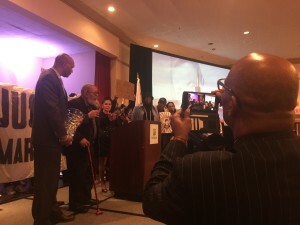 The annual breakfast had a great program that included music from the wonderful Latin Youth Jazz Ensemble and tributes to the history of the Civil Rights Movement and reports on the challenges and injustices we still feel. 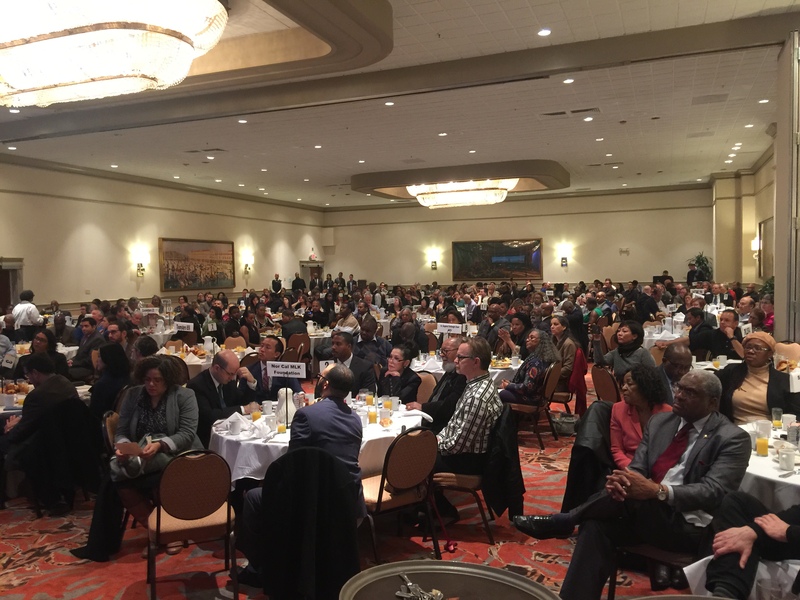 The breakfast was attended by hundreds of union members, community activists, pastors, faith leaders and elected leaders, including 8 of the 11 San Francisco Supervisors and all of our legislative representatives in Sacramento. We were proud to honor Reverend Cecil Williams and Janice Mirikitani, co-founders of the wonderful Glide Memorial Church and Foundation in the Tenderloin, which has been serving food and providing programs for underprivileged men and women and families in San Francisco for over a generation. During the program one protester managed to get inside, jumped the stage, and shouted the demands of the Justice for Mario Woods Coalition, which was formed to decry the killing of a young man in the Bayview. The brother played it cool and was all dressed in a suit and tie to sneak in and be able to shout the coalition’s demands: “Full investigation into the shooting, charge the officers, fire the police chief.” The attendees were respectful of his message and his right to speak it. Rev. Williams signaled to us that he wanted the protester on stage when he received his Willie B. Kennedy award. My co-emcee, Aaron Grizzell, and I, along with Sean Farley from the International Longshore Workers Local 10, took it a step further and went outside to bring all 20 or so protesters into the room to be on stage with Cecil and Jan. It was a historic organizing event. Bridging any divide between the attendees and the protesters, Rev. Williams spoke of the importance of supporting this new movement and the power of love and working together to end injustice, wherever it is. The San Francisco Labor Council has taken a position in support of the Black Lives Matter Movement and in support of many of the positions of the Justice for Mario Woods Coalition. We did not support firing the police chief. 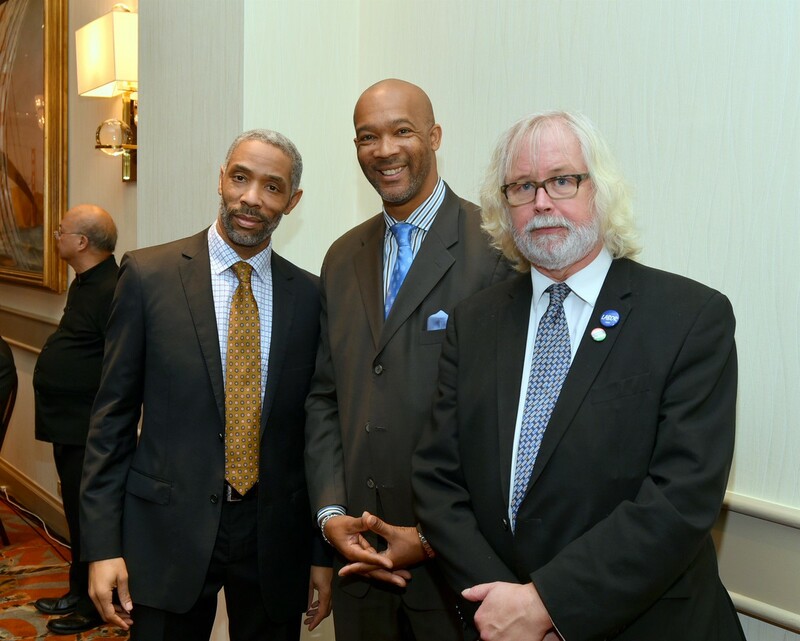 This was a special San Francisco confluence of organizing at the breakfast. Thank you Rev. Williams for your Grace, and to all the participants who made this a memorable MLK event of tension and compassion that ultimately included everyone! This entry was posted on Monday, January 25th, 2016 at 3:57 pm	and is filed under Blog. You can follow any responses to this entry through the RSS 2.0 feed. Both comments and pings are currently closed.